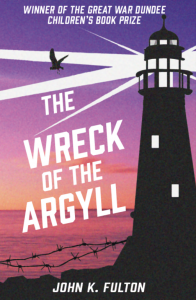 I am extremely pleased to announce that my first novel, The Wreck of the Argyll, is going to be reissued by Cranachan Publishing in early 2018. A WWI spy thriller for children based on the real-life wreck of HMS Argyll on the Bell Rock Lighthouse, The Wreck of the Argyll won the Great War Dundee Children’s Book Prize in 2015. Dundee, 1915. When twelve-year-old Nancy suspects one of her teachers is a German spy, she ropes in the reluctant Jamie Balfour to help her uncover the scheme. Midshipman Harry Melville is aboard HMS Argyll in the stormy North Sea, unaware of both hidden rocks and German plots that threaten the ship. Nancy and Jamie discover HMS Argyll is in deadly danger and they are drawn into a web of espionage, secrets, and betrayal, where no-one is as they seem and no-one can be trusted. The Wreck of the Argyll was first published in 2015 by Cargo Publishing, but didn’t get off to a great start in life when Cargo went under a few days before publication. Fortunately, Freight Books picked up Cargo’s backlist and allowed the publication to go ahead, but Freight has had its own well-publicised problems of late, so when I got my rights back, I was thrilled that Cranachan, who published my second book The Beast on the Broch in 2016, offered my first book a new home. The fit really couldn’t be better – Cranachan’s YesterYear series concentrates on Scottish historical fiction for children, so The Wreck of the Argyll joins stories about the Highland Clearances, the Second World War, and Victorian Scotland along with my own tale of Pictish times. I’m absolutely delighted with the new cover, which Anne at Cranachan designed. The original cover, by Michael Gallacher for Cargo, was inspired by Dundee schoolgirl Qynn Herd’s competition-winning drawing, and I asked Anne if she could produce a new cover that drew on that same inspiration – a silhouetted lighthouse, a purple sky, and barbed wire, and she’s produced a striking and dramatic cover image.